If there is handle length in a clip, then it is possible to move the clip within the length by the shortcut Control and +/- (from the number pad). This maintains the length of the clip while nudging the audio within. This is especially useful if you have a sync point or so and have the exact length but just want to fine sync the clip. It can also be used in situations where you want to create a good length of audio but don’t want it to sound very loopy. There is a cool feature called Bus interrogation in Protools 10. Lets say you have a set of tracks routed to a bus called Percussion, some routed to Vocals, etc. If you want to instantaneously see all the tracks that are routed to Percussion Bus, you can Right-Click on any track that has that output, and select Show only assignments to Percussion (Or whatever the name of the bus is), it will hide all the other tracks and just show the ones routed. This set of tracks can then be quickly grouped, the view saved as a window configuration or just check if any thing is routed to the wrong output. Within the EQ-3 by holding Control and Shift (Mac) and clicking on any of the frequency knob or point on the display, you can make a band pass quickly for that frequency which you can adjust the q factor and also sweep.. It can be used for finding any problematic frequency. 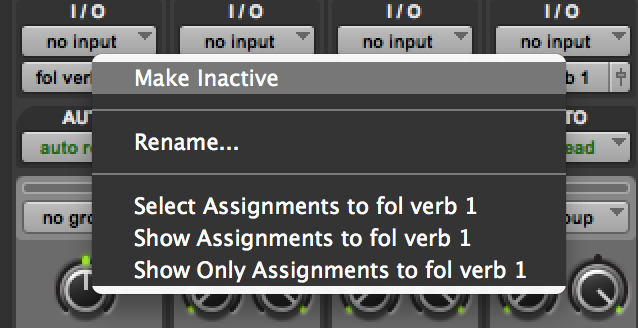 The same also works for the Channel Strip Plugin.